Nestled in a quiet cul-de-sac is this superb three bedroom detached residence! Having the benefit of being sold with no chain, this wonderfully presented ideal family home has a real welcoming feel, plus offering plenty of benefits such as a well-kept garden, open plan living, good sized conservatory and driveway, along with gas central heating and uPVC double glazing. Situated just a short stroll to the promenade and Vale Park, and well placed for the excellent range of amenities in New Brighton including those at Marine Point, frequent bus services and direct rail line to Liverpool from New Brighton train station. 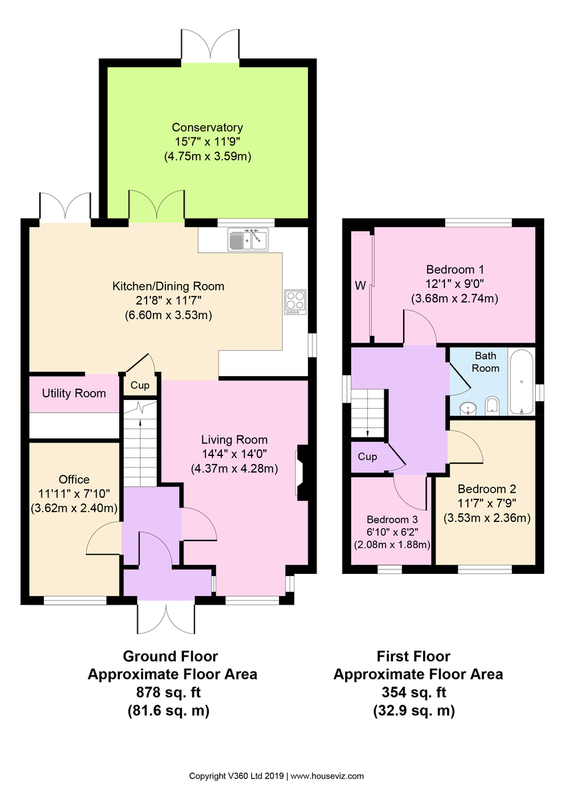 Interior: porch, hallway, living room, open plan dining kitchen, utility room and conservatory on the ground floor. Off the first floor landing there are three bedrooms and modern bathroom. Plus there is a converted garage. Exterior: good sized, sunny and low maintenance rear garden, along with a front driveway. Be quick not to miss out; what more could you want? DINING AREA uPVC double glazed doors leading out into the rear garden, plus another set of uPVC double glazed doors opening into the conservatory. Two designer central heating radiators, inset ceiling spotlights and aforementioned laminate flooring which continues into the kitchen. Door into Utility Room. KITCHEN AREA Matching range of modern dark wood base and wall units with contrasting work surfaces and diamond style tiled splash back. Stainless steel one and half bowl sink and drainer with mixer tap over, which sits below the uPVC double glazed window looking into the conservatory. Electric hob with chimney style extractor above and double oven set into tall unit. Integrated dishwasher and ridge freezer. Inset ceiling spotlights and additional uPVC double glazed window to side elevation. UTILITY ROOM Range of base and wall units with contrasting work surfaces over. Space and plumbing for washing machine with additional space for fridge freezer. Central heating radiator. CONSERVATORY 15′ 7″ x 11′ 9″ (4.75m x 3.58m) uPVC double glazed windows to three sides of the conservatory with fitted blinds; creating an excellent added reception room to this lovely home. uPVC double glazed door leading out into the rear garden. Power, lighting and laminate flooring. BEDROOM ONE 12′ 1″ x 9′ 0″ (3.68m x 2.74m) uPVC double glazed window to rear elevation with central heating radiator and laminate flooring. Handy wardrobes with sliding mirrored doors. BEDROOM TWO 11′ 7″ x 7′ 9″ (3.53m x 2.36m) uPVC double glazed window to front elevation with central heating radiator. BEDROOM THREE 6′ 10″ x 6′ 2″ (2.08m x 1.88m) uPVC double glazed window to front elevation with central heating radiator and laminate flooring. MODERN BATHROOM uPVC double glazed frosted window to side elevation. Modern white suite comprising deep filled bath with mixer tap and overhead mixer shower, low level WC and hand wash basin with mixer tap over inset into handy drawer storage unit. Ladder style radiator, tiled walls and laminate flooring. REAR EXTERIOR What a lovely rear garden which wraps around the side of the house, being very sunny and therefore can be most enjoyed over the summer season! Being low maintenance with astro turf and an area laid with stone chippings, boasting ample space for garden furniture and children’s play equipment if required. Fully enclosed and not directly overlooked benefiting from external power points, side access and two sheds which will be included in sale. FRONT EXTERIOR A pleasant approach to the property with a garden area to the side. Driveway providing off road parking which would be suitable for two vehicles. CONVERTED GARAGE 11′ 11″ x 7′ 10″ (3.63m x 2.39m) A superb bonus is the converted garage which can be used as a storage room or office space, amongst many options. LOCATION New Tower Court can be found off Molyneux Drive, a turning off Rowson Street approx. 1.6 miles driving distance from our Liscard office.